Apart from being one of the most striking architectural features, the gas lights that hang over the Industrial Gallery are an important reminder of the Museum’s roots. They are beautiful to look at and vital to telling the story of Birmingham Museum and Art Gallery. However, they are also mysterious and we are still trying to find out exactly how they functioned. This picture shows the Gas lights above the Industrial Gallery during the 1960s. During this period they were not visible from the gallery. The gas lights have a number of different names. 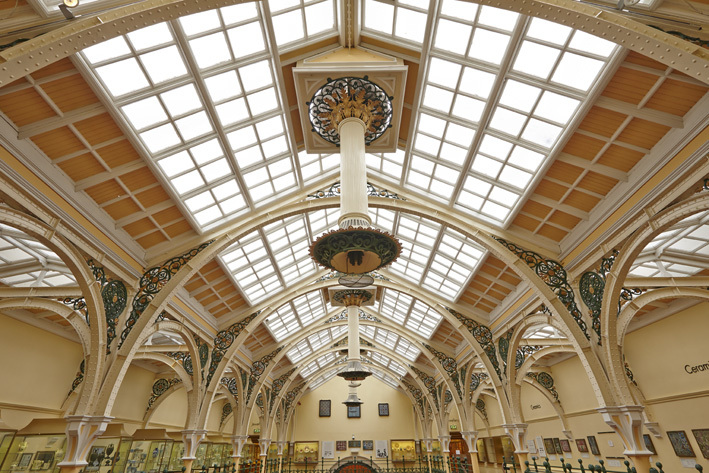 The term ‘Gasoliers’ comes from French ‘chandelier’ and is frequently used in literature about the museum. However, my favourite name is ‘Sun-Light Burners’. This was used to describe them in the minutes made at meetings about opening a gallery. Apart from being vaguely poetic I prefer this term because it accurately reflects their job. 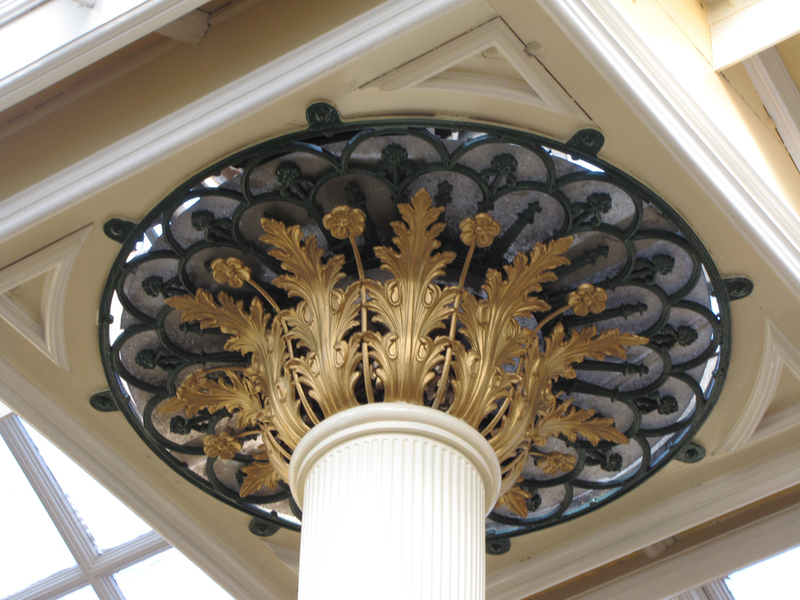 This is the top of one of the lamps in the Industrial Gallery. There are seven gas lights in total. Two in the Edwardian Tea Room, three in the Industrial Gallery, one in the Round Room and one above the Vestibule reception area (in every room of the original gallery). They were manufactured by Messrs. Strode and Company from London for the cost of £488. 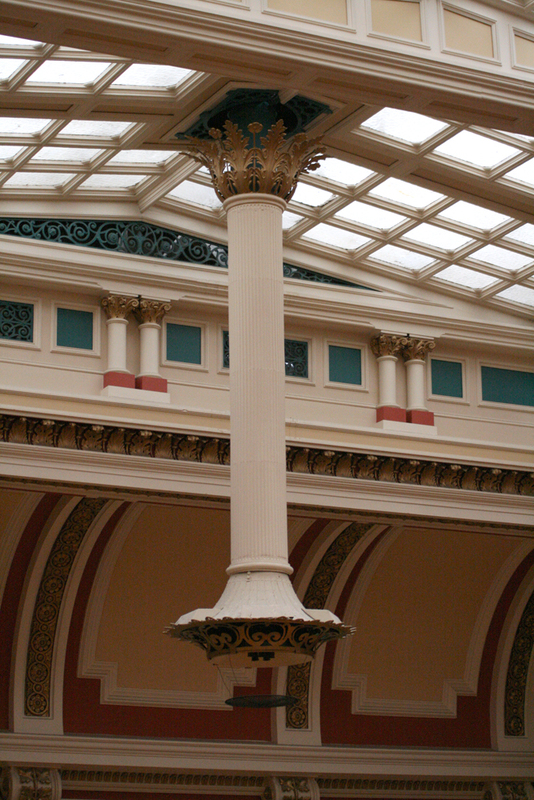 This is the lamp above the Round Room. I imagine this lamp in particular would have looked like the sun when lit. The purpose of having gas lights was revolutionary. It reinforces the argument I made in my previous blog entry about how Birmingham Museum and Art Gallery was an institution designed by the people and for the people. In the 1880s Art Galleries were the domain of the middle classes. As well as being a place to see beautiful objects they were also a place to be seen by your peers. Because museums were lit only by sunlight they were only worth visiting during daylight hours. Working class people, generally, did not finish work until the evening and therefore would not be able to see the exhibits. By providing gas lights Birmingham Museum and Art Gallery enabled these people to view the exhibits too. This explains why the term ‘Sun-Light Burners’ applies so well. The Museum was established specifically to inspire the artisans, therefore it would have been a huge mistake if they could not view the things specifically displayed to inspire them. 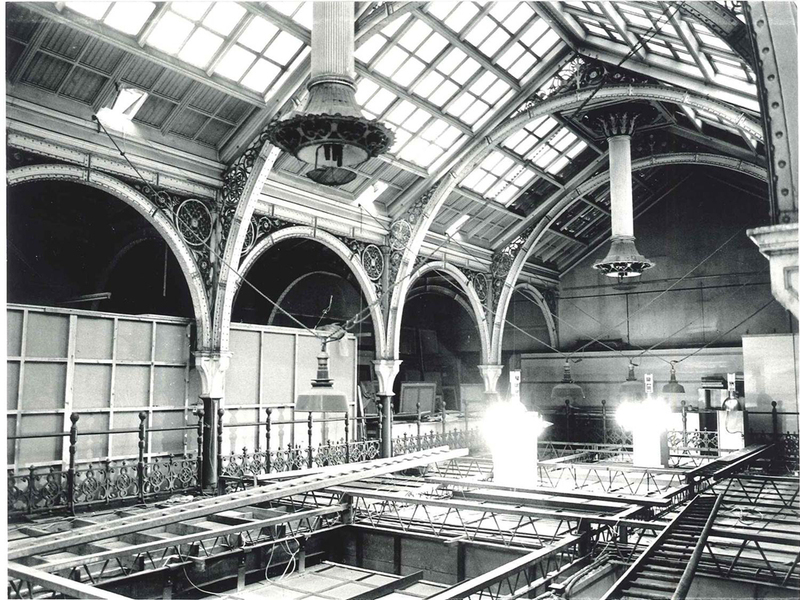 When the gallery opened in 1885 it was on top of the newly municipalised city gas offices. Nowadays there are only two things to remind us of this: the Foundation Stone in the main entrance and the gas lamps. 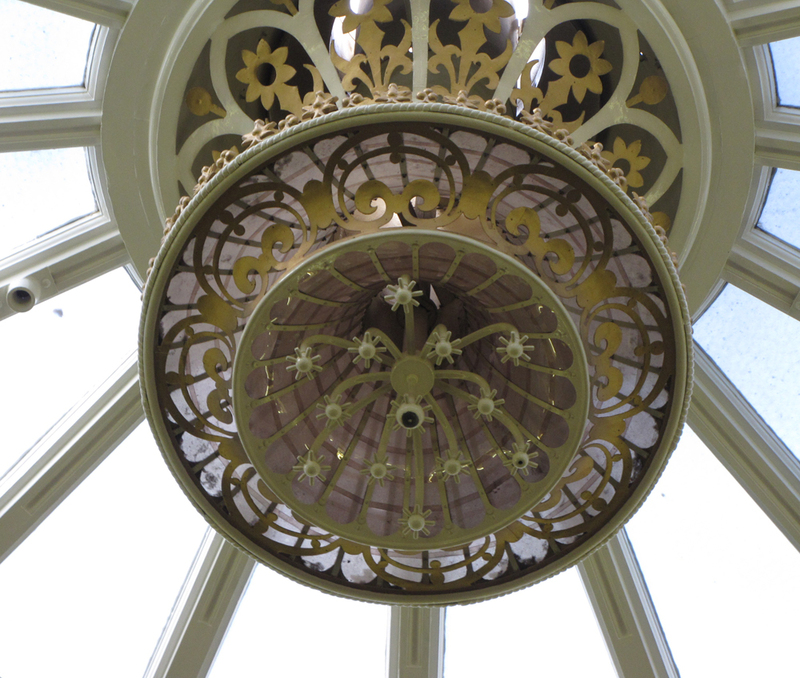 This is one of the Lamps above the Edwardian Tea Room. So the practical considerations: how were these lights lit? Naively, when I first considered this question I imagined a Victorian man leaning over the iron work on the balcony of the Industrial Gallery with a large wooden stick, prodding the lamp from a distance and hoping for the best. Obviously, this was not the case. In the case of the lamps above the Vestibule and Round Room, they were winched down to a gentleman below who would light it, shout up to say it was ready, and then be winched up again very early in the morning. It is clear to see that the entire structure would have moved because today they are hidden away in the ceilings. When stood in the roof space this sort of movement is also evident from the design of the lamps themselves. This shows the mechanism used to winch the lamps down so they could be lit. 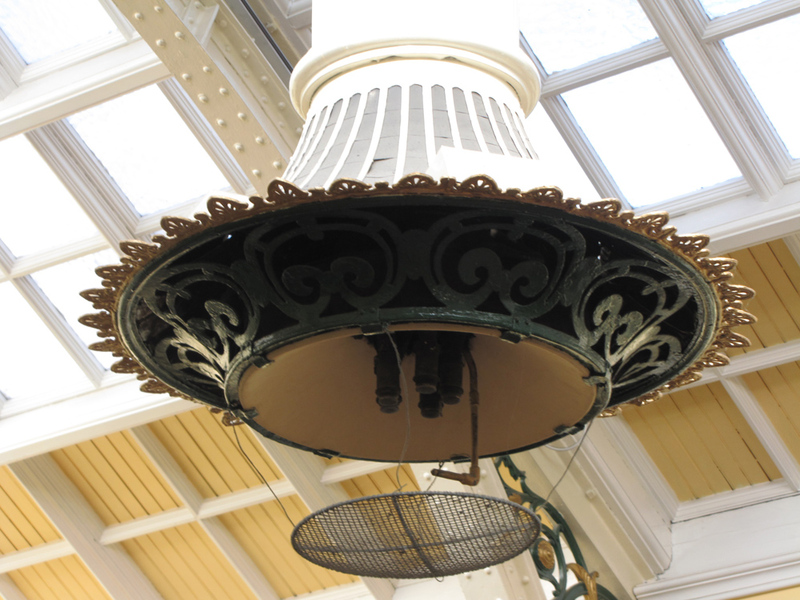 For the lamps above the Edwardian Tea Room and Industrial Gallery the procedure less obvious. There are winching mechanisms in the roof space but the outer structure of the lamps is clearly static. I am currently waiting to see the original blue prints, which will reveal the procedure but at the moment my best guess is that an internal part was winched down to the floor where it was lit and then brought back up. This is a close up taken of the pipe where the gas came out. The one question we, as Visitor Assistants, always get asked is ‘do they work?’ As the lamps used Town Gas, which is no longer used, it is impossible to tell. Also there are a plethora of conservation issues connected to having gas lamps and oil paintings in immediate proximity so it is probably for the best that we don’t use them today! So the importance of these architectural features is huge. They remind us of the connection to the gas offices. They are a visual symbol of the equalising effect Birmingham Museum and Art Gallery had on the cities communities when it opened. They also fill everyone who sees them with curiosity and invite questions that we still cannot fully answer.